A network diagram visualizes the way components of a computer network connect with each other. It is used to keep track of, troubleshoot or plan computer networks. Common network components include servers, routers, nodes and hubs. Computer network diagrams map out the structure of a network with a variety of different symbols and connections. It is the best way to show the layout of a network because the visual presentation makes it easier to understand how network items are related. 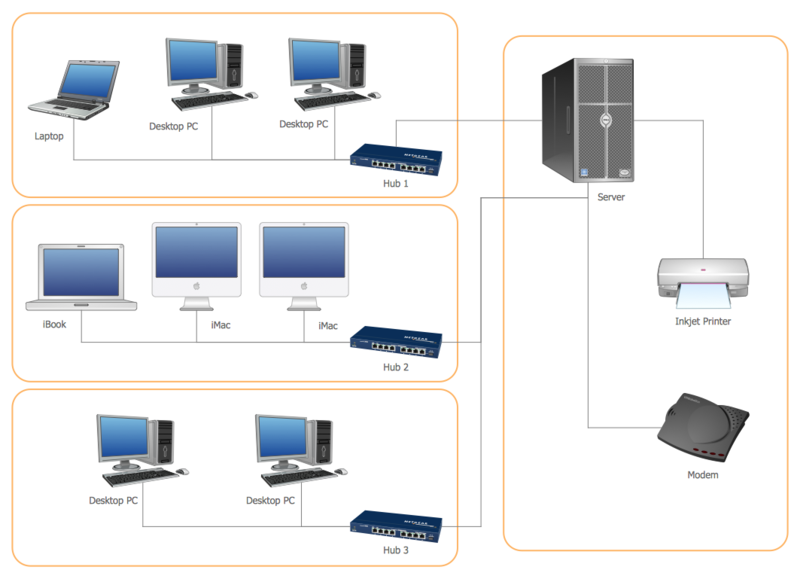 ConceptDraw DIAGRAM allows you to create computer network diagrams of several types: active directory, logical network diagram, Cisco diagram, rack components diagram. Open a ConceptDraw DIAGRAM new document. First, set the page size and orientation using the Document Properties options. Open libraries from Computer Network Diagrams section and add objects to the drawing by dragging them from the libraries panel to the document page. Use Clone tool to quickly add copies of the object. To add text to an object just click it and then type your text. Let's connect the objects with smart connectors. To connect elements using this tool , drag the connector from one connect dot to another. You can add text to connectors in the same way as to objects. Result: Now you can represent and communicate network architecture, topology, and design to engineers, stakeholders and end-users.